Rich Benjamin sharply observes modern society and politics. His cultural and political analysis appear regularly in public debate, including in The New York Times, The Guardian, The New Yorker, The New York Times Sunday Book Review, NPR, PBS, MSNBC, and CNN. 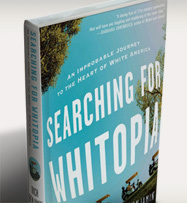 He is the author of Searching for Whitopia: An Improbable Journey to the Heart of White America, selected as an Editor’s Choice by Booklist and The American Library Association (2009). Born in New York City, Rich grew up in far-flung places (in the US and abroad). He devoured English and political science at Wesleyan University (BA) and Modern Thought and Literature at Stanford University (PhD). Rich was recently a Fellow in the literary arts at the Bellagio Center (Italia), Rockefeller Foundation. He sits on the Board of Trustees of the Authors Guild, the national union of writers that has been protecting authors’ rights and free speech since 1912. © Rich Benjamin 2019. All rights reserved.